I recently shared with some friends that you can tell what you think the Bible is for by examining your own primary use of the Bible. Consider four typical ways people use (or think about) the Bible, and then consider a fifth important addition to all of these. When people use language like, “The Bible is Basic Instructions Before Leaving Earth, (get it, B.I.B.L.E.?! ), they are telling you that they primarily think of the Bible as an escape manual that tells you how to get from earth to heaven (instead of hell). Just follow the simple instructions, and when you die, you’ll go to heaven. That’s why we can think of this as the “soterian” approach (or an approach that thinks of the Bible as primarily about salvation). A favorite verse for the soterian approach is 2 Tim. 3:15. #2 – The Sophia Approach – The Bible as a devotional book. 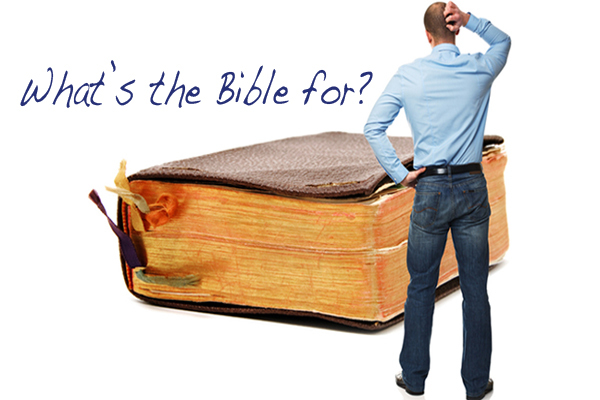 #3 – The Secret Formulas Approach – The Bible as a “spell” book. Okay, “spell book” might seem a little harsh, but stick with me (because I’m sticking with the terminology). The person who takes this approach to the Bible thinks of it a a book of secret insights that have to be mined out into a pile, then re-assembled into a formulaic system that can be followed step-by-step. Adherents of the Word of Faith theological system are masterful (uhem!) at this approach to the Bible. Need healing? 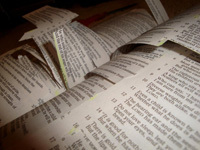 Just find 5, 6, 8, or 10 verses about healing from wherever you can in the Bible (regardless of their original context), assemble them into some kind of logical order, then point at your list and say — “There, that’s what the Bible teaches about how to get healed!” The “spell book” approach wants to see the verses that have been discovered in the secret formula as things that you have to “believe really hard” and say out loud over and over again (never doubting, of course) so that the spell will work, and you can get the outcome you desire. People who take this approach to an extreme tend to think of the Bible as something that “works” (like good magic works if you do it right). What if we shouldn’t be mining through the Bible looking for the escape plan so that we can craft a well-articulated “plan of salvation,” or looking for inspirational verses to get us through our day — helping us to be more successful and effective in our pursuits, or trying to find secret formulas to make the Bible “work” for us, or looking for laws to obey so that we can keep God happy and remain in God’s good graces? What if we shouldn’t be pushing all that narrative aside, imagining that the really good stuff in the Bible is somehow hidden in the text, or that there is a lot of superfluous text in between the really good and important stuff that the Bible has to say? 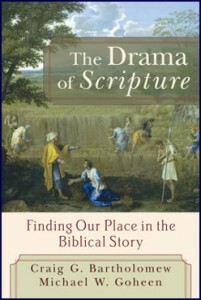 I was in a conversation a few days ago with a friend and we were talking about the idea that “the Bible is a grand narrative — a story.” She instantly recoiled at the idea, and thought that when I used the word story, I meant something like “fairy tale” or “moralized fiction” or perhaps even “myth” in the sense that we use fiction in order to advance a moral or spiritual agenda (like Aesop’s fables or Greek Mythology) — something like that. Nope. That’s not what I mean. The Bible is a story that we can join by jumping into the redemption project that God has begun. Where do we jump in? I suggest that we get into the story between Acts 5 and 6 above. The Bible is the story of a King and his Kingdom. We join the story by submitting our lives to the Lordship of the King (that is, we learn the ways of the King, then we obey what we learn — cf. Mat. 28:18-20). When we join the King, we join the Kingdom. When we join the Kingdom, we join the story that lasts forever. All other stories (national, personal, etc.) are temporary, and will come to an end if they don’t connect to the only true story — the only eternal story. What does this have to do with reading the Bible? Once I began changing my understanding of the Bible, seeing it as a grand narrative, and the story that we get to join, I began reading the Bible differently. As I read, I see the unfolding purposes of God over time. I see how God revealed himself to his people along the way. I see how he shaped them for his purposes and his Kingdom project. I see how the story comes to a crescendo in the life, ministry, crucifixion, burial, and resurrection of Jesus. I see how the early Jesus-followers kept the story going forward in the book of Acts and the letters. I see where the story is ultimately headed in Revelation. I see invitations to know the God of the Bible, and to join His Kingdom. So, I’m not looking for rules to obey. I’m not looking for daily inspiration. I’m not looking for formulae or spells to cast at my problems. I’m keeping the story straight so that I can live in it, and walk forward with it in my own life, world, relationships, and contexts. Yes, God will speak to me as I read. Yes, I’ll get my understanding of truth (e.g. doctrine) ironed out as I read. Yes, I’ll learn how to deal with my issues as I watch others in the pages of the grand story interact with God. I suggest that this question can be used every time we come to the Bible alone, with a small group study, with a younger believer in times of discipleship, in preaching, or even in academic study. If we keep the story central, realize we’re invited to join it and move forward with it — and realize that it is the only true story of the world — our lives can truly be shaped by Scripture! Thus, I propose that shaping the whole world that God has made, and the people that he loves, into HIStory is what the Bible is for! For a bit more help, and a longer discussion of Biblical Theology (as contrasted with systematic theology), and a survey of both the Old and New Testaments through the discipline of Biblical Theology, read two other important posts here and here.